Hi Paul, I have used your longline gear for four years now off the east coast from Whangarei and tow it out with a Kayak instead of a kite. 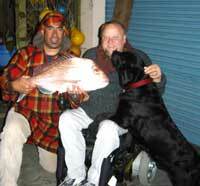 I picked up these two 8kg fish on Monday 27th September on a dusk set. They were the only two fish caught - no other baits taken - obviously they were mooching around on their own. Looks like they are just starting to get on the move. Thought you might like to see the best results we've had! I drove up Muriwai Beach 5 kilometers past Rimmers Rd on Friday 8th October and caught this 9kg snapper on a red floating bead trace. I had baited up with absolutely fresh kahawai caught on my first set. I fished the incoming tide in 25 knot northeast winds with a Night Hawk powered dropper rig. We entered onto to the beach from the motorcycle park up by Rimmers Road and headed north for about 3km. We didn't think it was an ideal spot to stop as the surf was breaking so far out but we were limited to where we fished because of the incoming tide and the amount of other kitefishers taking up the best spots along the beach. With a good wind, steady 15 knots plus, we set the gear with only 11 hooks and left it to fish for half an hour. When we pulled it in we had caught nothing and had a big tangle in the hook section. We discovered we had put the traces too close to each other and this was the cause of the tangle. We set the gear again with 11 mullet baits and when all the line was off the reel the kite still looked like it was sitting just out behind the breakers, gives you some idea how far out the waves were breaking and how strong the rip was. We left it to fish for half an hour and when we pulled it in we found we had caught eight snapper and a gurnard. 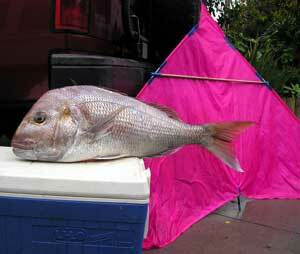 All of the snapper were over 400mm long with the biggest weighing in at 6.9kg. I knew the biggest one was a reasonable size fish and wanted to know it's actual weight, so I stopped at a gas station on the way home and used their LPG scales to weigh the fish on. We also caught about 11 gurnard and a trevally (Pic above left). 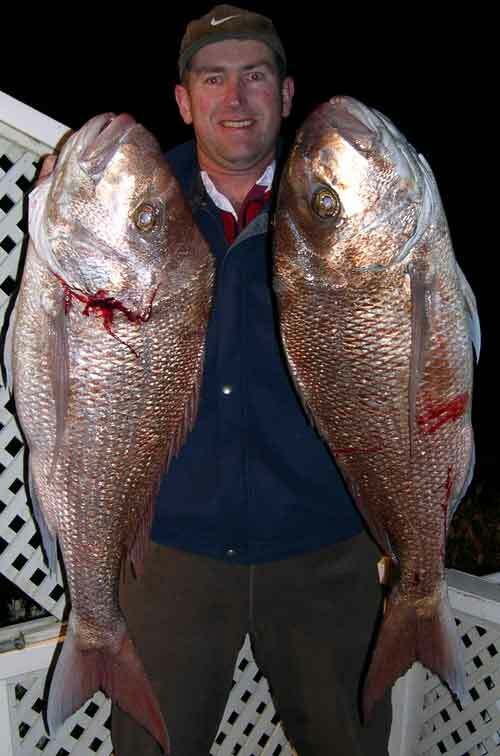 My mate has landed three snapper over 17 pounds in the last six weeks, the biggest was 27 pound. Just did one set this morning with a bottom longline and power chute kite. Went like a dream. Caught two good snapper and 15 gurnard. Yesterday with the same gear I landed a 12.6 kg snapper. 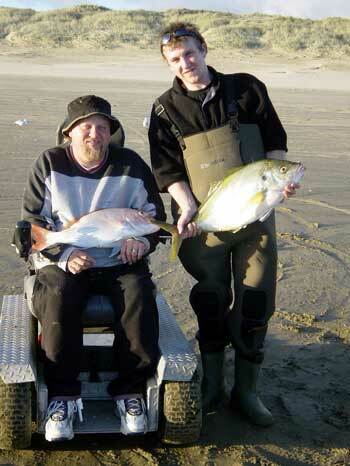 Further down the beach Jeff Litton was fishing the same gear which he'd only purchased two months ago. 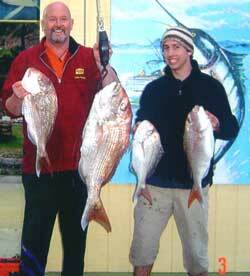 Jeff caught two snapper (9.7kg and 3.0kg) and six gurnard using salted kahawai bait. ED : Geoff also reported that the boaties have been setting their cray pots overnight and getting their bag limits. In fact, they're having to throw some back. 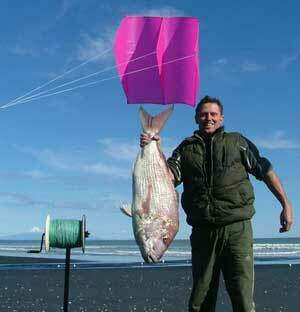 While staying at the Whatuwhiwhi Top 10 Holiday Park recently, several people using kites have had good catches. Mark Jarvis who had been kitefishing all week around the 26th of September from Tokerau Beach, was catching 5 to 6 pan sized snapper every night just on dusk. Brett Iti was introduced to kite fishing while staying at Whatuwhiwhi. Fishing off Karikari Beach Brett left his kite rig set for around three quarters of an hour and caught a 5.8kg snapper. 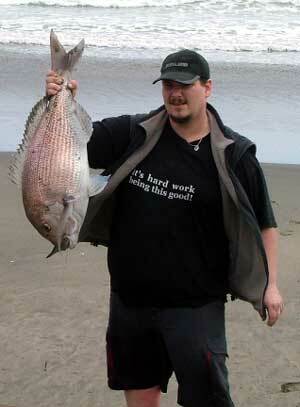 On October 3rd Mark Delacy (The Minstrel) kitefished from Ninety Mile Beach at around 4pm on an outgoing tide. Mark caught 4 kahawai and 4 snapper up to 7.22kg. The 2nd Karikari Kitefishing Klassic is to be held on the 2nd - 4th December, 2004, based at the Whatuwhiwhi Top 10 Holiday Park, on the Karikari Peninsula. Having spent quite a bit of time learning through trial and error about the do's and don'ts of kite fishing, (mostly DON'TS), we finally had a good steady set floating out on a 10 to 20 knot northwesterly at Tora Beach on the South Wairarapa coast. We were using squid bait on a small pocket sled dropper rig. We had set the 15kg rig out to about 300 meters offshore and were close to a river mouth (I must get more line!). We got out just far enough for a couple of tasty 40cm red cod to find their way onto the line. The wee kite flew beautifully for as long as the line was out, about 90 minutes, which was long enough to do three separate sets. We didnt even realise we had a fish on until we pulled the first and second sets in, as the drag was minimal, probably either due to the type of fish or the fact that the floating bottle had provided enough resistance to tire the fish out by the time they got to shore! The wife and sister-in-law are claiming they caught the bigger fish, but I for one can't remember who was holding the line at strike time. The cod were delicious and absolutely melted in our mouths as barbequed fillets a couple of hours later! I'll be looking to further improve my rig and set out a bit more often over the coming summer! I would just like to thank you both very much for the help that you both have given me over time with my kite. On Sunday I broke my tail string on my sky hook and rang Rob and said "mate I just broke my tail string on my sky hook", he said, come on down and I will fix it for you now. This was on a Sunday!!! 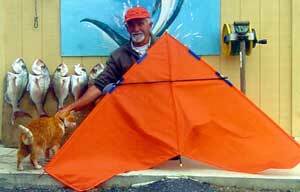 Thank you Rob, it is people like you that make Paul's fishing kites what it is today, well done and thank you very, very much. There has been lots of recreational fishers and commercial boats coming within 300 metres offshore so watch out for these, and if using a dropper rig, limit your distance to where you can keep the line clear of the water. Believe it or not, broad daylight sets seem to be fishing well at the moment, we've wasted a lot of time with evening sets. There are patches of foul ground and I am setting straight over them. We recently set 25 hooks baited with squid and caught seven snapper. At last a feed of fresh fish. On the 2nd October it was low tide at 5.30pm. The wind was southeast but was too light for our kite. We put the torpedo out and got 11 snapper in two sets. Went down again on the 6th, tide low at 8 30pm, put torpedo out at 7pm and got eight snapper and a dogfish on the first set, the doggie was great smoked. On the second set we got another five snapper. 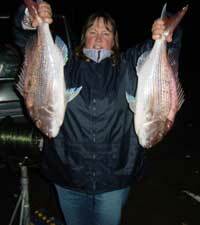 Some people are kite fishing in the daytime when the wind is right and they are catching gurnard and a few snapper. Had not been out for a fish for at least a month, so was really pleased when a decent wind finally came along so I could use the last of my frozen trevally bait. I was talking to an old fisherman, who told me he quite often uses WD 40 or CRC on his baits, with really good results he assured me! So I thought hey, why not give it a go? So I did, I sprayed WD 40 on the last 12 baits to go out and four of the six gurnard we caught were taken on these baits. We also caught a large monk-fish (stargazer). I had never eaten one of them before, and have found they are quite nice!.